Advanced technology has contributed to tremendous growth in production since the middle of the 20th century, while farmers have been able to reduce inputs, including labor, chemicals, and energy. The agricultural and food industry accounts for 13 percent of Washington State’s economy. Biotech, “flying tractors”, designer orchards, and robots have changed everything on the farm, from planting to harvest to packing house. 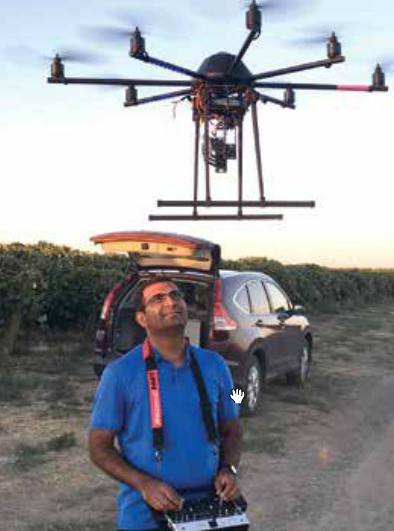 At left, Washington State University professor Dr. Lav Khot flies and eight-bladed octo-copter unmanned aerial vehicle or drone.